Pretty good as a basic CRM, decent as a support desk. Tries to do a lot, but doesn't excel at any one thing. Reasonably priced, though, and can be a component in a larger setup. Traffic is suitable for most agencies, regardless of size. You don't need to use all of the features in order to get good results. And it can be linked to Maconomy which is useful for larger agencies. We have around 80 employees and it works great. Tracking customer interactions. Nice integration with G Suite, could be a lot better if they acknowledged that contacts may actually have more than one email address. Support Ticket system is integrated, so we can view support history and other email correspondence easily. It's cheaper that Zendesk. Support is reasonably good, usually prompt and responsive. Constant development - lots of updates, just not often to areas that we use. Detailed reporting on tasks, jobs and projects. Cumbersome processes - feels like tasks take longer than they should. We gave up on the Projects module, it was rather unintuitive. Switched to JIRA, which integrates with the Support module of Accelo. Each email address requires a new contact. If one person uses multiple email addresses to contact you, that info will have to be spread across multiple contacts. I would like to be able to colour code my clients, so I can see at a snapshot what projects staff are working on. I would like to be able to colour code staff holidays, public holidays so I can easily see what resources I have available. As an administrator, I can't see at a glance the actual time spent on a task work or comments a user has logged. Synergist - does the same thing, but the interface was far more complicated to use. Looked like a bit of a nightmare to use. Didn't get too far reviewing this one. Was too concerned about on boarding with our workforce. Paprika - saw a demo, looked 'OK', heard bad reviews from friends in the same industry. Appeared to be plagued with the same issues as Synergistic. Paint to use. Streamtime - Tested this thoroughly. Loved the interface, and very nearly bought this software over TrafficLIVE for that very reason. In the end it did not allow us to separate time into distinct categories such as 'estimated', 'quoted', 'scheduled', and 'actual'. In Streamtime, if you stretched the time next to a task, it seemed to also adjust the estimate as well. In contrast, Traffic separated time into these dimensions for every task, resulting in a far more useful data set for reporting. Finally, Traffic was cloud based, which meant that I didn't need the added hassle of hosting and maintenance. In my opinion, Streamtime is suited to a smaller business, maybe 5-20 employees. It might have improved now but it's been two years since I reviewed it. It substantially reduced the number of systems we use to run our business. It reduced the need to train our staff on a variety of platforms. It gave us the ability to have a client-facing portal that directly integrates with our backend systems. Much more clarity as to how much time each different type of brief should take to complete as we can back reference as to how long it took last season. It has lead to better customer service. We can visibly demonstrate where we are with jobs and who has been assigned. In the past verbally confirming the different stages did not always convince the project leaders that they were being given the actual real time. 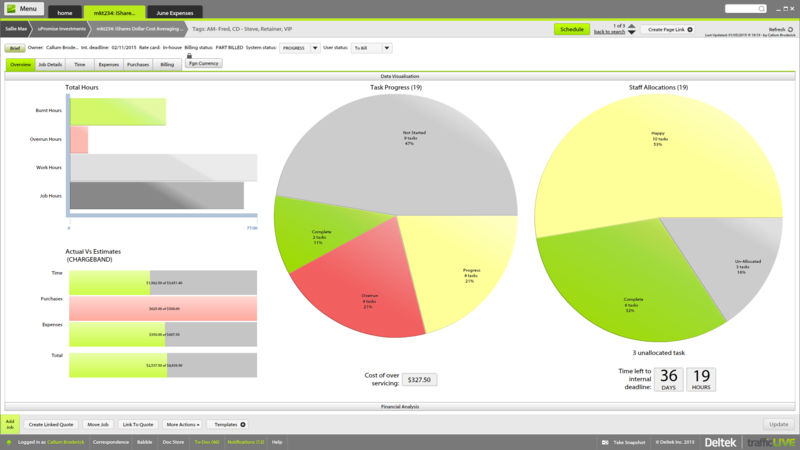 From the Studio users point of view it has empowered them to manage their time more efficiently. If they receive a request to move onto another job their calendars can be reviewed to see if they are available or not. TrafficLIVE offers solutions for small to large agencies. Our prices range based on number of users and requirements.